swimming | Random Thoughts: If not now, when? I found a picture, from last year, of our destination islet. As you can see, it’s not quite a Bum’s Rest, but not really big enough for a picnic. 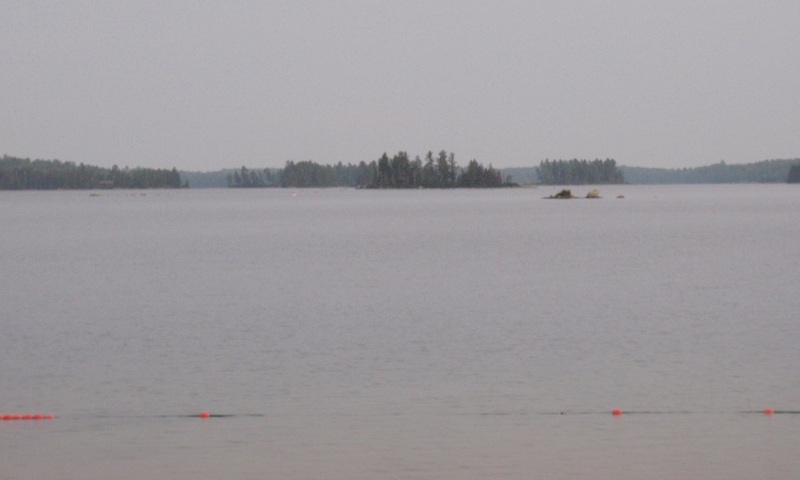 The granddaughter and I had a good swim on our vacation, a 900-metre round trip to a tiny island. The surface water was warm and the deeper water was refreshing. I mapped our route to get the distance. We figured about 450 metres, and it seems we were right! Unlike our swim a couple of years ago to the palm-tree island in Nottawasaga Bay, this one was not cold enough for wetsuits. Here’s the map for our 2009 swim in Blue Mountain, which was about 550 m each way and not quite straight. Today we drove to Hamilton and watched a high-school swim meet. It’s the last one before the Golden Horseshoe regionals. Drowning is not the violent, splashing, call for help that most people expect…. Drowning is almost always a deceptively quiet event. The waving, splashing, and yelling that dramatic conditioning (television) prepares us to look for, is rarely seen in real life. The Instinctive Drowning Response – so named by Francesco A. Pia, Ph.D., is what people do to avoid actual or perceived suffocation in the water. People can’t cry out or reach for a life-ring: they’re fully occupied pushing their hands down in the water and breathing. They don’t even kick. And you have only tens of seconds to get to them. A bunch of us had a swimming lesson last Sunday, and it was fun. Nottawasaga-Bay-50, originally uploaded by monado. 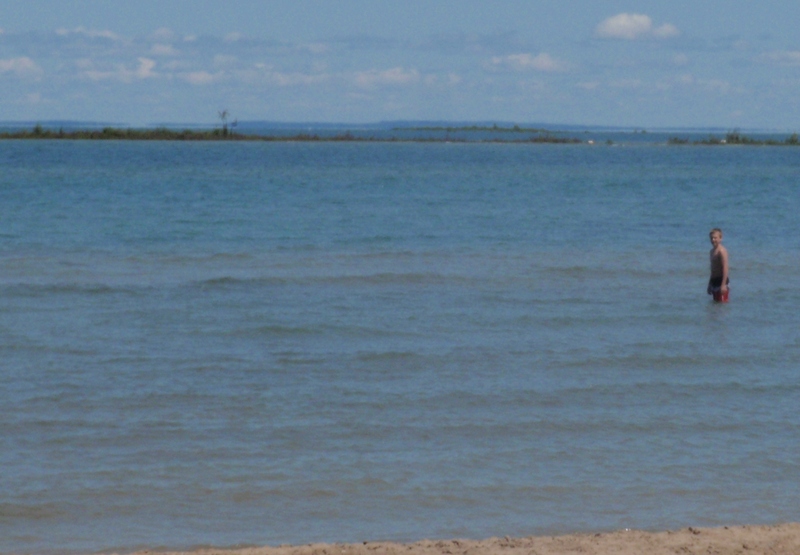 One of our entertainments on holiday was to spend a few hours at the beach of Nottawasaga Bay at Blue Mountains. The older and younger generations did a long swim. We chose as our target “palm-tree island,” where someone has built a couple of artificial palm trees. The middle generation created an Om symbol out of sand. 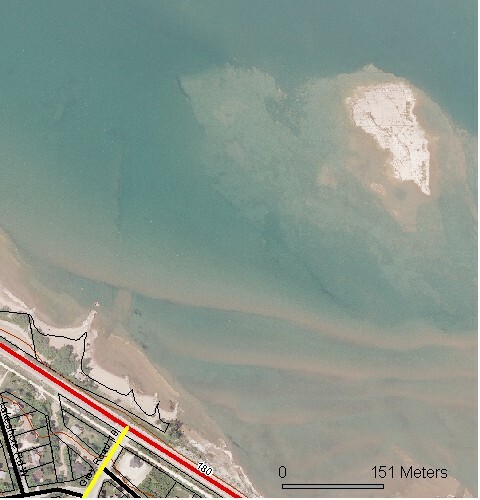 Here is a satellite picture: we swam out, from the beach to the right of the pier, to the island and back. We left before heat and humidity built up to destructive storms, including a downburst of wind. I have some amateur movies of LotStreeetWiz swimming in Lake Simcoe (at Sibbald Point) under a relatively heavy swell, And a couple of very short videos of me. In the first one I got water up my nose on the first plunge and stopped. On the second one I again stopped too soon. But I got to see how funny I look, curving my hands and placing them in the water. LotStreeetWiz gave me a new, WATERPROOF camera for my birthday! The waves were a couple of feet high. The wind was blowing waves in onto the beach at an angle. He wore his De Soto wetsuit and beach shoes. 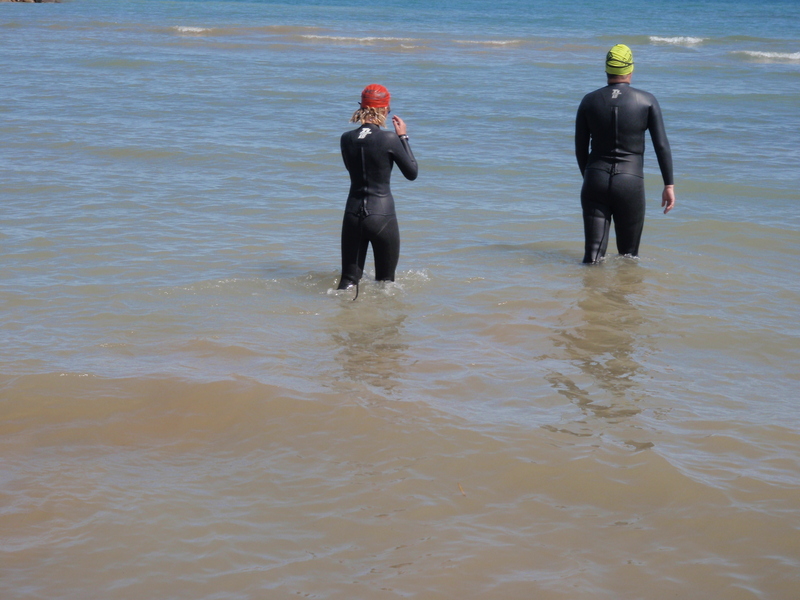 We swam downwind at first in a marked area and beyond (because the marked area was only about 4′ deep). It was OK just bobbing around but trying to make headway was another story. We swam with the waves parallel to the beach. The substantial surge may have made LotStreeetWiz a bit dizzy, although he didn’t mention it. I know I had to swim carefully so as not to get tossed around and dizzy. We swam past one of those rock “docks” that protect the beach in their lee and in the relatively sheltered water made a couple of movies of each other swimming. In the deeper water, too deep for waterfowl or mink to forage, the rocks are covered with sharp little zebra mussels. The first thing I did was scrape my ankle on a stone or a shell. I had to sit on the rocks to film because otherwise I was bobbing up and down as much as LotStreeetWiz. Actually, the first thing I did was step on a stone walking into the water. I scorned to use my beach shoes because it was a sandy beach & paid for it right away. We also tried swimming out towards the buoys that marked the end of the “no boats” zone hoping that the waves were only high because of the beach. While they were slightly less abrupt, they were still high in deeper water. I suspect that the wind had been blowing all day and building up the waves all across the lake. The height of waves depends on the wind strength, the length of time the wind has been blowing, and the distance across the water that the wind has to work with (the “reach”). It was a bit scary trying to swim upwind and up-wave, back around the rock outcropping. The waves kept trying to push us back onto the rocks and their impersonal strength is intimidating. I switched to breaststroke and went under a lot of the waves. I wish LotStreeetWiz had a secondary stroke for such occasions. We could have played in the shallows more, but we were both getting tired and the waves were getting stronger. It wasn’t quite as much fun as I’d hoped but we got wet and tried it. I wish it weren’t quite so long a drive because waves like that would certainly be good practice for open-water swimming if we were mentally prepared for them. Next time: swim up-current and upwind first, then down when we’re more tired.